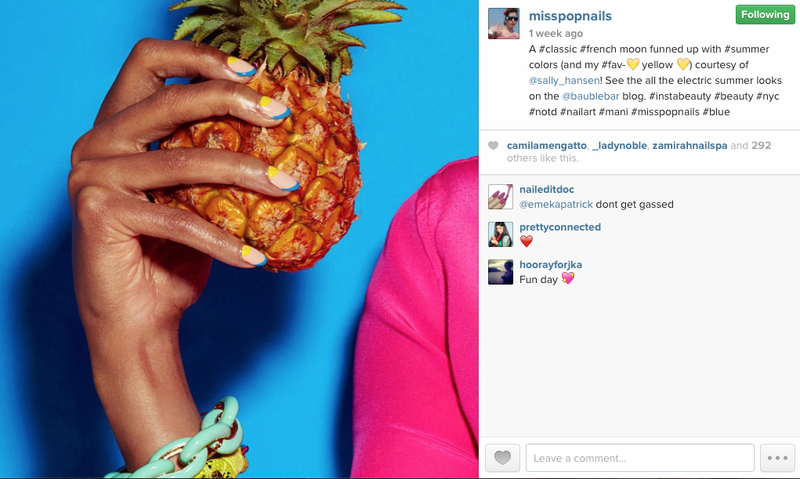 This week, inspiration came from Miss Pop Nails' Instagram account. For the base coat, I used two coats of Paper Mache. When that was dry (read: the next morning), I used semi-circle and simple chevron stickers to map out where Celtic Sun, Shocking Pink, and At Vase Value would go. Then, with a small, flat nail art brush, I applied all of the colours--two quick coats--and then peeled off the stickers. As usual, there was bleeding (*shakes fist*), but I managed to clean most of it up with a narrow nail art brush and some acetone. I sealed it all with a coat of quick dry top coat (HK Girl's Glisten and Glow for those who are interested, haha!). It was still missing something, though, so I added two studs to the fingers with Shocking Pink. I love how, when I'm inside, Celtic Sun is all: Hey, I'm neon yellow! But the second I step outside, it's all: HEY! I'M NEON YELLOW! LOOKATMELOOKATMELOOKATME! Haha! 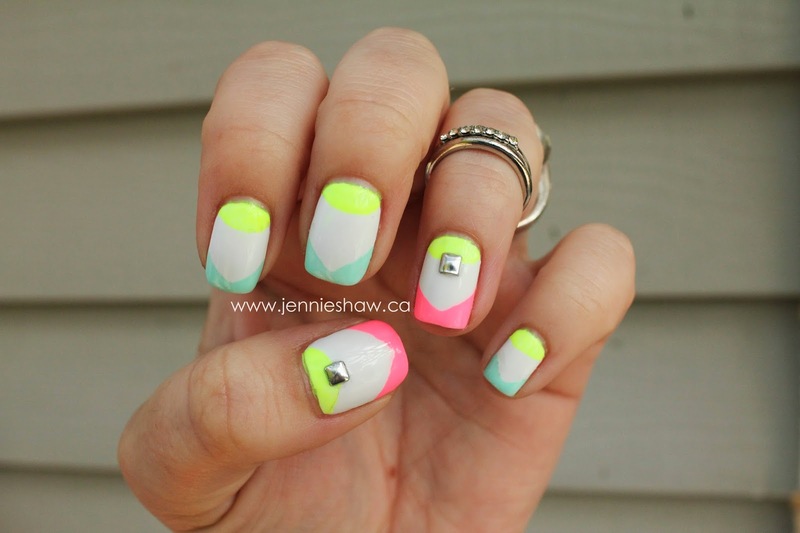 I love all the different shapes going on in this mani and the yellow really does make it all pop. I so wish we live closer. That way you could paint my nails. I have NYC taxi yellow on my nails. That is cheeping. Yes yes yes! You have been knocking it out of the park lately! I am LOVING all the details you've had going on (also, my husband might not let me hang out with you anymore--because now I really, REALLY want to go to Sally's and buy ALL THE NAIL ART SUPPLIES!) Who am I kidding? He'd be all "that's great, sweetie. Glad you found a hobby." Kidding, sort of. Would you believe I don't have a single neon in my collection? I've been tempted by Flipflop Fantasy, but every time I see it in person it's way more orange that I'd expect. 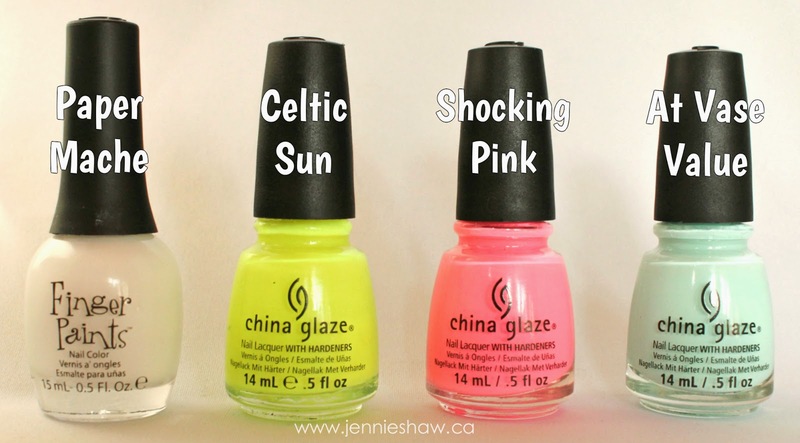 Maybe shocking pink is the way I should go! JENNNNNNIE! I love these nails!!!!! Such great color combos and your lines/moons came out awesome. Love Love Love Love! I've really been wanting Paper mache. Still haven't gotten it yet. Those colors are great together.